"He makes me to lie down in green pastures; He leads me beside still waters." In Hebrew, “green pastures” is literally “meadows of grass.” The word for “grass” refers specifically to fresh or green grass, as opposed to mature grass or hay, for which a different term is used. In this photograph, some of the sheep are lying down in a green pasture. A green pasture is the ideal place for sheep to feed. Note that the word “makes” in this verse does not indicate compulsion—it simply means that the shepherd leads the sheep to a place where their food grows abundantly. The sheep will eat of their own accord and will lie down once they are fully fed. A sheep lying down in a green pasture is satiated and content. It is natural that David uses this shepherding metaphor, since he himself was a shepherd. He must have shepherded flocks of sheep in the area shown above, which lies just outside his hometown. Unfortunately, the fields of Bethlehem long used by shepherds are quickly being covered over by urban sprawl. 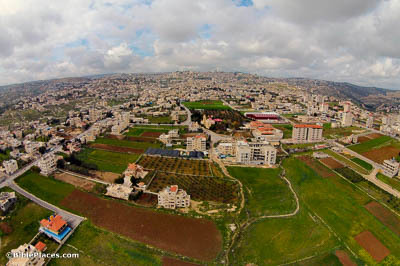 The building with the reddish-pink dome in the center of the photograph is the Greek Orthodox Church of Shepherds’ Fields, commemorating the announcement of Jesus’s birth to shepherds near Bethlehem. David’s use of the word “lead” in this verse is not accidental. Sheep are always led, not driven, by shepherds in Israel. “Still waters” is probably not the best translation of the Hebrew, which literally means “waters of rest.” The idea seems to be of water that the flock can rest beside, or where the flock can find refreshment—not necessarily placid water. 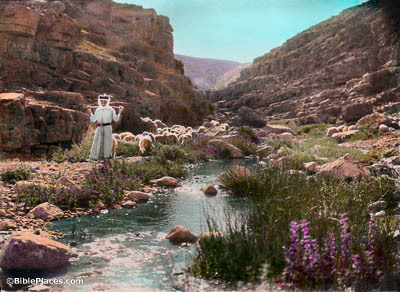 This hand-colored American Colony photograph was taken between 1900 and 1920, likely in the Wadi Qilt east of Jerusalem. 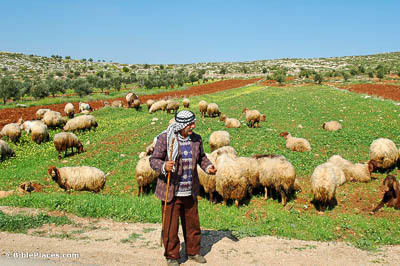 Besides the food found in green pastures, sheep also need water to drink—daily, in the climate of Israel. A good shepherd will find a good source of water for his flock, no matter how scarce it may be in places like the Judean wilderness. 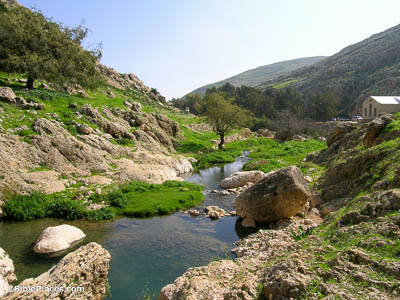 The waters of this spring, called Ein Perat, are one such oasis in the largely barren desert.